Night bus on Union Street, Aberdeen. 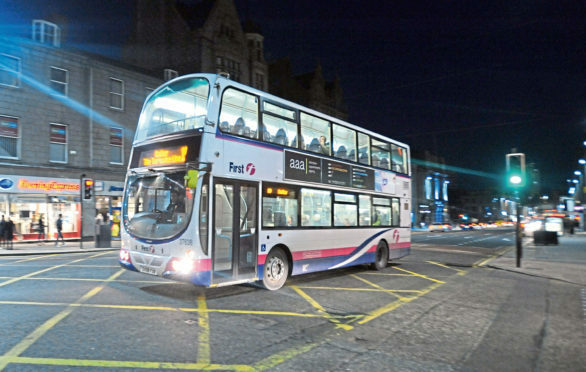 Nobody should be surprised by the news that First Bus is taking a scythe to its nightly bus services in Aberdeen. Indeed, for anybody who has relied on public transport across the city after the evening rush hour, the writing has been on the wall for many months. There is a sign on one of the Stagecoach vehicles which caters for passengers on the 15A service, who live in Airyhall and Countesswells. It reads: “NHS Grampian is going smoke free in 2015.” Which doesn’t exactly inspire confidence that these buses aren’t living in the past. Even at the moment, prior to any further cuts being enforced, the service is patchy and the prices exorbitant. Anybody who might be thinking of travelling to Aberdeen city centre for a concert, arts event, or restaurant booking, has pretty much to rely on taxis from early at night. During the week, the draughty, clanking 15A buses only run once an hour from 8pm onwards. On Sundays, they don’t run at all. If you live in Countesswells, a region where 3,000 new homes are being constructed, it’s as if nobody has done any joined-up thinking to prepare for the significant population increase. And this is happening at the same time as the local authority is urging the public to be more environmentally conscious. Several residents have told me they would like the council to take back control of the buses in Aberdeen. 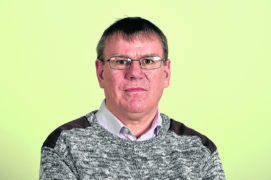 But that isn’t likely to happen, given the financial constraints on officials in the north east. So the buck-passing continues, the malady lingers on and it’s the public who suffer, especially students and elderly residents or those who fancy some social refreshment and choose to leave their cars at home. Perhaps the people making these decisions should witness the difficulties they cause first-hand. Because, believe me, Union Street isn’t an ideal loitering place when you are attempting to get home from work at 9pm as the nights draw in, let alone in the wilds of winter.